No one likes that moment when you have to terminate an employee. Unfortunately, as the owner of your dental practice, there will be times when it's necessary for you to let an employee go. Whether it's due to poor performance, issues in patient care, or ethical concerns, you want to be sure that you're following the right steps in letting the employee go legally. Writing a solid severance agreement will ensure that you are protected legally if things don't go according to plan. In some cases, you might want to offer compensation for someone who is forced to leave your practice--especially if you are forced to terminate their employment on the grounds of something like an overall decrease in business or the need to move to a location that is no longer convenient for them. The practice shutting down is also a good reason to offer a reasonable severance package. In some cases, you may choose to provide severance pay as part of the firing process for employees, especially one who has been with your practice for a long time. There are several things to consider when offering a severance package to employees that you're forced to terminate. Your severance agreement paperwork can include the reason the person was let go. In every state but Montana, you can fire an employee for any reason that's not illegal. This includes poor job performance, failing to meet expectations, or being a distraction to other staff members as well as causing drama throughout the workplace. Note, of course, that you cannot fire any employee in any state because of their race, religion, gender, disability (including pregnancy) or age. Note that you should also be careful in engaging in a contract, including a verbal contract, that gives employees a reason to assume that they have been promised continuing employment with your practice. Monetary Compensation: In some cases, you may offer employees a portion of their regular paycheck in order to help them make it through the tough time between leaving your practice and finding new employment. Sometimes, it's a goodwill gesture intended to help soften the blow of unemployment; other times, it's a nod to the service that the individual has given your practice in the past. Determining monetary compensation as part of a severance package may include the number of years that an employee has been with your practice or the type of position they held, especially if they were in a trusted position for a long time. Continuing Insurance: Acquiring a new insurance policy can be a challenge, especially when your former employee is seeking new employment options. 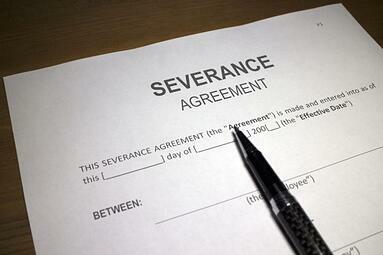 Part of your severance agreement should include when they'll lose their insurance coverage. Does it end at the end of the month? Will you continue to pay for your portion of their health insurance for a period of time--a month or two, perhaps--while they look at their options? Pension Programs: Consider whether or not you want to contribute to your employee's pension as part of their severance package. Whether it might not help immediately, it will certainly help later--especially for employees who may be nearing retirement age. Note that the employee's last paycheck, which should include pay for all of the hours worked prior to their termination, is not part of the severance package and should not be considered as such. This amount, rather, is compensation for the time that the employee spent with your practice. Also keep in mind that you are not responsible for any financial arrangements for employees who are being terminated--these items are considered to be a bonus and are often offered due to a practice's inability to keep employees on, rather than when an employee has been fired due to poor behavior. If an employee has been terminated for a reason that would lead them to be able to file for unemployment under normal circumstances, they will still be eligible to file for unemployment even with a severance package. Note that in some cases, the severance package may delay the time before an employee begins receiving unemployment benefits, but it doesn't stop your practice from needing to pay unemployment as needed. A legally-written severance agreement doesn't decrease a former employee's rights, though it does tend to be an indication that the employee was fired fairly, and not due to any of the reasons that could cause them to seek legal action. Entirely aside from the severance agreement itself, there are several things you should keep in mind when you have to terminate an employee at your practice. These simple tips will ensure that everything is legal and above-board--and therefore that it won't come back to haunt you later. Wait until you calm down. No matter how bad an infraction, send an employee home for the day before you fire them on the spot. Take the time to think things through and allow both of you to cool off before you make a decision. Don't do it alone. Bring another trusted individual--your partners, perhaps--into the office while you take care of the conversation that must be held. This will help ensure that you have witnesses and prevent the potential for future legal issues. Keep it short. You do need to give a reason for the termination, but there's no reason to go on about it excessively, either. Document everything. Keep track of all any disciplinary actions, conversations you've had to have with your employees, and any recurring problems that have led up to the termination. By tracking this key information, you'll have proof of the employee's actions if it's ever relevant. Terminating an employee can be hard, both from an emotional standpoint and from a financial one. In order to ensure that you're taking care of it properly, make sure you're including these key steps in your severance arrangement. A strong severance agreement will help protect your practice as well as ensuring that your employee doesn't have a reason to take legal action against you.